Accidents can cause enough problems and cost enough lives in a built-up area. Out in the wilderness the dangers increase exponentially. If a group of you are out there and someone has an accident, you have to act decisively to tend to the injury and take care of the injured person. No group should be out in the wilderness without several of the party knowing first aid. It can be, quite literally, a lifesaver. There are plenty of first aid courses run all over the country – try St. John’s Ambulance – that can give you a grounding and the ability to cope with most basic injuries. The very first thing to do in the event of an accident is to not panic, and to keep everyone else calm. After that you have to assess the situation. Do this initially without touching, to see if there’s an immediate danger to life of the person who’s had the accident or any others in the party. If, say, they have an axe or a knife stuck in them, remove it carefully. But you need to know what the situation is, and what you have to deal with, in order to take the appropriate steps. From here the most important thing is to ensure that the injured person remains alive. If they’ve lost consciousness, try to bring them round. Make sure the airway is open to allow breathing (if not, you might have to perform an emergency tracheotomy). Check the pulse, especially if you can’t detect any breathing. If necessary, begin the CPR you learned in first aid class. If breathing is normal, put the patient in the recovery position and then check for bleeding on the body. With a person who’s injured, but awake and mobile, you should be prepared for them to go into shock. Keep them warm and dry; erect a shelter around them if need be, if they can’t make it to one you’ve built. 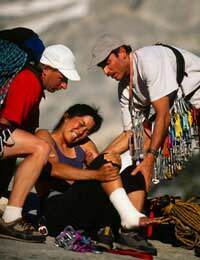 With any injured person you need to assess the extent of any injuries and decide what to do about them. With broken bones you’ll need to cut wood for splits, for instance, and fasten them in place. With cuts, apply dressing from the first aid kit after first cleaning the wound as best you can. Do as much as you can for the patient, but realise that whatever training you have will set limits. You’re not a doctor and you can’t diagnose everything. Where the injury means that the person can’t go on easily, you’re going to need to summon assistance. You should never leave without a fully-charged mobile phone and you can us this to call the emergency services. The problem can occur when you’re in an area with no reception. Where there are several of you, one person can be sent for help while the rest of you tend the patient. If there are just two of you, then you will need a system to contact people. One good solution is to build a smoky fire, although you need to make sure it’s carefully controlled. Also, have some large squares of brightly coloured cloth for signalling. Only as a last resort should you leave the patient alone to try and obtain help.